There has been mixed reactions to a secret deal granting immunity from prosecution to former President Robert Mugabe. 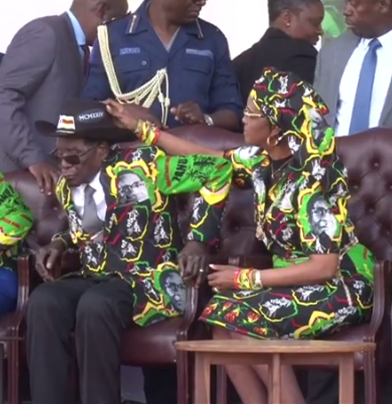 The 93-year-old ex-president was reportedly granted a $10 million golden handshake, immunity from prosecution and secured assurances that he and his family will be protected in Zimbabwe under a deal that led to his resignation. University of Zimbabwe law professor Lovemore Madhuku told the Daily News yesterday that the Constitution already gave Mugabe immunity. “He already has immunity in terms of the Constitution. Section 98 grants immunity to former presidents. At the time that he left office, he already had immunity. “When you say someone has been granted immunity, you should also be able to say who granted him? I think the fact that Mugabe was granted immunity is false. "There is no immunity outside Section 98 of the Constitution,” Madhuku said. It gives immunity against civil or criminal proceedings. Another lawyer Tonderai Bhatasara said that there are questions on who granted Mugabe immunity, if ever it was the case, arguing that the prerogative of mercy only lies with the President. Reports suggest on the day he tendered his resignation, Chief Secretary to the Office of the President and Cabinet Misheck Sibanda, attorney general Prince Machaya, Catholic priest Fidelis Mukonori, Justice minister Happyton Bonyongwe, Defence minister Sydney Sekeramayi and Mugabe spokesperson George Charamba had a morning meeting with Mugabe that lasted about four hours. “Political immunity is not supported by any law,” Bhatasara said. “A new government can always revoke that. It doesn’t apply internationally. One who gives immunity is the one who has been wronged. Like what happened in South Africa when Grace Mugabe was granted immunity, it was South Africa that had been wronged. It’s the wronged party that can grant immunity. “He can’t continue to have privileges of immunity internationally. What can only happen is that maybe the locals who have granted him immunity can refuse to hand him over to the International Criminal Court but if he goes outside the country, he can be arrested. “What is not clear in this case is who was representing the government in the agreement and his resignation letter did not state the conditions. There is need to sanitise the immunity with statutes through a Statutory Instrument that will be published in the Government Gazette, then people can be able to challenge that. “This is because there are people who were wronged and if they keep the deal to themselves and someone raises summons against Mugabe for atrocities he committed, they will not be able to raise the issue of immunity as a defence,” Bhatasara said. Opposition political parties on the other hand said Mugabe’s age can work in his favour. The mainstream MDC led by Morgan Tsvangirai has said it was not a vindictive political party, but won’t subscribe to impunity and unaccountability. “There has to be closure to all these very unfortunate incidents of our post-independence history. “The victims also need closure so that they can get on with their lives in peace,” MDC spokesperson Obert Gutu said. Tendai Biti’s People’s Democratic Party (PDP) spokesperson Jacob Mafume said at his age, Mugabe would be declared unfit to stand trial. “The man has passed the threshold for senility and dementia for a while now. Remember he is a man who read the same speech twice and did not realise it. During his rule, tens of thousands of people, especially from the opposition were incarcerated by the State. “Remember the case of the former strongman of Chile (Augusto Pinochet), he was declared too old and sick to stand trial by an international process,” Mafume said. His counterpart from the National People’s Party (NPP) Gift Nyandoro said it is unfortunate that Zimbabweans are not being told of the full story of the said immunity deal and are hence speculating and constrained on making meaningful comments on the issue. “However, from a broader perspective, immunity deals should not be done in a manner that destroys the content and essence of people’s democratic aspirations. There is no doubt that post-Mugabe presidency, there is need for closure of outstanding national questions like Gukurahundi massacres. “Secondly, there is need for genuine land audit and redistribution. The world wants to know how many farms does Mugabe have and what happened to $15 billion of mineral proceeds he failed to account for? National healing and a return to constitutional democracy is not achieved through cutting of immunity deals but through comprehensive due processes,” he said. The Welshman Ncube-led MDC through its spokesperson Kurauone Chihwayi said that even if Mugabe is granted immunity in Zimbabwe, he cannot escape the ICC.